Search for Durango's unique selection of lodging properties. Chose from a wide variety of hotels, bed in breakfasts, cabins, condos, RV parks and more! 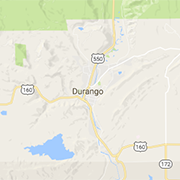 Browse to begin your Durango adventure and find your exceptional home-away-from-home. Luxurious creekside Durango bed and breakfast minutes from downtown. Prepare to be pampered! Fully furnished 1, 2, and 3 bedroom cabins and vacation home rentals located at Vallecito Lake, Colorado. Location is the key! This family RV Park & Campground is based right on the Animas River and on Durango's Trolley Stop! Providing exceptional service to visitors of the Durango area with vacation rentals such as ski condos, riverfront cabins, luxury homes, mountain styled townhomes, and more! Vallecito Resort near Durango, Colorado is your summer "home in the Rockies" offering camping, cabins, and full service RV hookups for individuals and large groups.